Chase Beebe had little trouble with Bo Harris, steamrolling his way to a unanimous decision victory. Beebe (22-7-1) used his stellar ground game and also worked a nice variety of striking. It was the fourth consecutive win for Beebe, and his second under the Bellator banner. Torres Martial Arts fighter Anthony Gomez (5-2) got his first Bellator win by choking out Jose Medina in the first fight of the night. 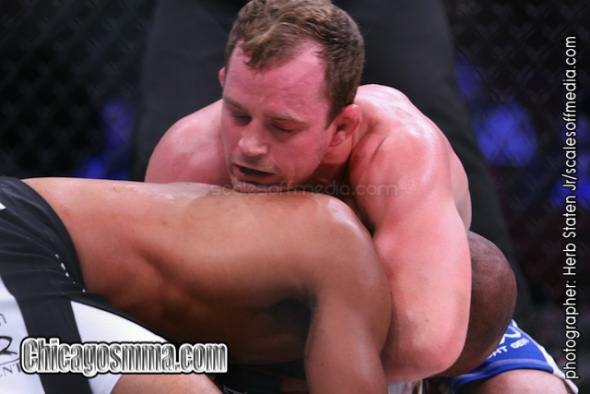 Gomez’ last fight was a Bellator 60 loss to Travis Wiuff. Bobby “The Believer” Reardanz (9-12) was submitted by Cliff Wright Jr., losing via rear naked choke at 3:39 of round 1. Reardanz took a nasty knee to face that stunned him and allowed Wright to take him down. Reardanz did not mount much offense save for a triangle attempt from the bottom, but Wright was able to wriggle out. The turnout at The Venue was disappointing. There were plenty of empty seats, which was a stark difference from the sold-out Bellator 60. Local fighters Clay Guida and Shonie Carter were in the house, with Carter telling us that he is officially retired from MMA. Carson Beebe was on hand to corner his brother Chase with Dan Gilbert, and told us his next fight will be for Tachi Palace. Gilbert Grappling’s Matt Giancarlo took in the fights, and told us he does plan to fight again at some point, but nothing planned as of now. Bellator will return to The Venue at Horseshoe Casino on December 14 for Bellator 84, which will close out season 7 for the promotion. We also heard of an unconfirmed report that Bellator will be in the Chicago area for five events in 2013.